The SunFace has long been my favourite fuzz pedal. The BC108 nails all those classic silicon tones and more. Recently, AnalogMan released the BC109 version â€“ a tribute to David Gilmourâ€™s Dark Side of the Moon tones. Hereâ€™s my review. At the time when David Gilmour joined Pink Floyd, in early 1968, guitarists had only a very few pedals to choose from. The Fuzz Face was a staple in many setups and Gilmour, being inspired by Jimi Hendrix and continuing Sydâ€™s legacy, employed the germanium model alongside a wah and the Binson Echorec. By 1971, heâ€™d swapped the germanium for the silicon transistor Fuzz Face. The SunFace BC109 is housed in a MXR-sized chassis with the familiar AnalogMan gold colouring and a nice Floyd-ish graphic (done with taste and not the obvious references). In addition to the usual volume and gain controls, the SunFace also feature an internal bias or gain trimmer, although you rarely need this for silicon circuits. The pedal feature true bypass switching but appropriately lack a led and power input. Vintage circuit fuzz pedals are best operated with carbon 9V batteries. Fuzz pedals arenâ€™t for everybody. They can sound horrible on the wrong setup and it requires some time getting to know their nature and behaviour. In some cases, youâ€™re better off with a Big Muff or a much easier to use distortion, like the RAT or similar. However, a fuzz in its right element is perhaps one the most dynamic and versatile pedals you can place on a pedal board. Compared to the BC108, thatâ€™s featured in most silicon transistor fuzz pedals, the BC109 has a bit more of everything. More gain and dirt, lower end and crunchy top. Some might find it hard to tame and a bit too noisy but after some time fiddling with the controls and the guitar volume, youâ€™ll recognize all the sweet harmonics and its rich character. My favourite setting is the volume at about 75% and the gain at full, slightly rolled back to avoid those nasty oscillations. I also prefer pairing it up with a transparent booster, like the Colorsound Powerboost. Not necessarily for more gain but for a bit tighter lower end and a more focused and smoother top. With the guitar volume at 10 youâ€™re right in the Pompeii/Dark Side territory. The SunFace is breathing fire and producing an insane sustain and that familiar saw-like fuzz. Rolling the guitar volume down to 8-9 rolls off the top and adds a bit of compression. Rolling down further to about 5-6 will produce a smooth and crisp overdrive dead on Davidâ€™s tones from Obscured by Clouds and songs like Childhoodâ€™s End, Mudmen etc. If you prefer your fuzz nice and clean, then you might want to check out a germanium model or perhaps even a BC108. If youâ€™re up for taming a wild horse and get a breeze in your hair, then I highly recommend the SunFace BC109! Itâ€™s a stayer on my board! Check out AnalogMan.Com for more details. The SunFace BC109 was tested on both a Laney Cub 15w stack and a Reeves Custom 50, using Stratocaster with a Seymour Duncan SSL5 bridge pickup. If Bc109 got a bit more of everything, than Bc108, does it mean that with Bc109 you get the same sounds as Bc108, but with wider range? I guess so. 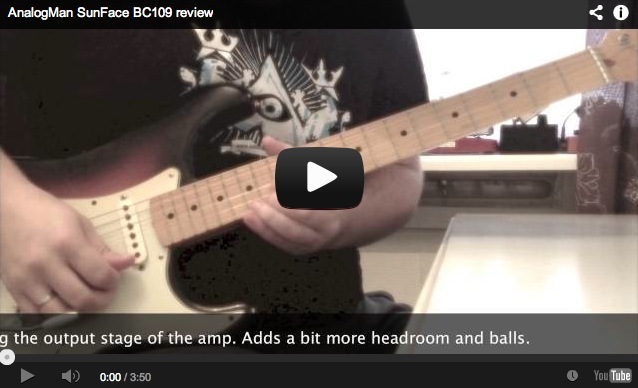 The BC109 has more gain and perhaps a tad darker tone. Closer to a Muff. It can cover the BC108 although the 108 has a bit more high end. Awesome playing and what a great sounding fuzz pedal. I see that Analogman does 2 versions of the 109 pedal, one with a 109B and the other with a 109C transistor. Do you know which version was reviewed? Thanks! Mine is the B. A question for you Bjorn, I have an Xotic SL Drive, would you use that to boost the sunface (with close to no drive at all)? and in that case, would you put it just after it on your board, or in the laney loop? Thanks for all the great work and congrats on the album, brilliant tunes. So, replying to my own query, it seems that it makes the sound feel… thinner. I still need to play around a bit more. Sorry for my late reply, Olivier. I’m not sure I’d use the SL as a booster as it has a lot of mid range, which isn’t ideal for boosting. Anyway, I’d place it after the fuzz in the pedal chain. Definitely a great addition in my arsenal! Here you can hear a recording of a concert tribute to Floyd with my band. Strat with DAllen 69’s, Analogman BC109 and CB Echorec into Clean channel of a Laney LH20. I loved your review of this pedal. This pedal is one of the tones I’m looking for. Ran across this site a month ago and all I can say is its great. Your reviews and tips have changed my outlook on playing. I had not played in years and decided to get back into playing. When I quit I was frustrated and didn’t have time to play. This website showed me some of my frustrations that i didn’t even know about. The first and biggest that I hadn’t considered was I was trying to play a Fender Hot Rod Deluxe in an apartment setting. Got frustrated that I couldn’t reproduce good distortion tones at low volume. I now realize that is way too much for my house much less an apartment. Switching to a Fender Blues Junior soon. Another was I never had my guitar setup. Bought a California Series strat back in the day. Someone told me I should have it set up. I ignored him. I’m an idiot. Had it done last night. Feels so much smoother. Much easier to play. The last I had the wrong pedals for the wrong things. Which in away goes back to the amp. I knew nothing of pedals and only knew of what was at the store. Mostly because I didn’t read guitar magazines. With all that said i may go with a Muff 1st don’t want to jump into the deep end since I’m just getting back into playing. I’ll worry about fuzz down the road. Hey Bjorn, I have Fender CS69’s in the neck and middle and an SSL-5 in the bridge. The tubes in my amp have been modified to AT7’s for more headroom and I have a Cannabis Rex speaker. Btw I’m looking forward to your solo album coming out. Is there a single coming? Hi Bjorn, what’s the lowest volume my deluxe reverb should be at in order to use a bc108 or 109 effectively? Around 2 or 3? do you think the fuzz would sound too thin at those volumes? I have been playing a Wampler Leviathan Fuzz pedal since it was available on the market. I also have a Wampler Velvet Fuzz which nails Gilmourâ€™s tone spot on if you ask me. The Wampler Leviathan can be switched between germanium and silicon. I tend to play it more in the silicon mode, which is why the AnalogMan SunFace BC109sparked my interest. I ordered one up this weekend, and should have it soon. My goal is just to have another fuzz box to play with, nothing more. Iâ€™m not chasing the Gilmour tone; I think Iâ€™ve already found that with the Velvet Fuzz if I need it. This was an excellent review, and incredible recording, BRAVO! Thanks for posting and sharing. On a side note, in another discussion thread I believe if Iâ€™m not mistaken you said you would post a review of the Mojo Hand FX Villanova, but never saw it. If itâ€™s tucked away somewhere, please let me know where. I recently picked up the Villanova, and I really like it. I sold an Earthquaker Devices The Depths for the Villanova. I prefer the villanova. I also have a Micro Vibe which does a fine job as well. Great sound but, after the first three hours I still cannot get it to produce sounds that I cannot match by fiddling a little with my RAT2. Tried it at both softer and louder passages/contexts. The analogman’s fuzz setting is only useful for the last quarter of the knob’s range, limiting the possibilities. A good (great) Analogman sound begins with V at 1:30 and F at 3:00 (not much left in the range). I achieved an almost identical (to my ears) sound with the RAT 2 controls set as follows: Distortion at 9:00; Filter at 12:00, and level at 11:00, with still a lot of the scales’ range availably for variation. Am I missing something? Hmmm…Idk which one to choose…so Gilmour never used a bc-109? Is that true cause from what I have read he used a bc-108 but like you said you can’t really hear much of a difference in the two anyhow. It would just be a personal taste in which one. Which one nails Pompeii better in your opinion? Because honestly man, I can’t friggin tell lol I play through a blues Jr most of the time, but Im going to get a fender hot rod deluxe lll 40 watt soon so which would be best in your opinion? btw I seen on analogmans site that Gilmour and Guy both used sunfaces during rehearsals. It had pictures of them using them. Did you see that? Anyway, thank you for your time buddy! God Bless! Mine arrived today! Wow it sounds good!Worth the wait!! Did you adjust the blue internal trimpot as well on yours? Ok, watched this video too many times! Pulled the plug on one of these last night… This is all your fault Bjorn! How long do they take to build? Can’t wait to get it. My BC109 sunface just showed up yesterday and I have been playing it through my 65′ twin reverb reissue this evening a lot. Really has more bite than my BC108 with sundial. I did not get a sundial on my 109 model and did not know if I would benefit from having it on there or not. So far I’m really loving the pedal and can’t decide if I like the 108 or 109 model the most, but there could be a tougher decision to have to make : ) Will have to let my band decide tomorrow. Will drop it on the time solo and see if they say anything. Also had a Throbak overdrive booster show up today and it has been crazy in my house tonight. My nearest neighbor is not too close but he is a policeman so hopefully he likes my tastes in music. I love this site and it has saved me a lot of trouble and even though it has cost me some serious money buying the gear I see here the reviews are honest and unbiased and the gear delivers as recommended. All the years ago that I gave up on getting these tones from the bad advice others had given me I wish I had known or this place had been around. Thanks again for helping me get my tone where it needed to be to match my playing. Hey Bjorn, I’ve been having some issues with cleaning up the Hendrix Tribute FF with my guitar volume, and enailed several builders to figure it out. There are two internal trimpots on the top of the board, and since both are all the way down, I’m led to believe they forgot to adjust them. I have my JH-F1 back, and so I’m covered, but the real reason for this post, and something that floored me was, while searching the forums about the pots, I found a post from Mike @ Abalogman, saying how much he liked the Hendrix reissue. In fact he said he was setting up his bc-108’s more like these Dunlop fuzzes since playing with one. He didn’t clarify whether he was talking about the F1, or new M1, but I should have an answer from him in a couple of days. I’m hoping he was talking about the trbute, and will thus have a working knowledge of the pedal, and be able to tell me if I can adjust the trimpots to cure the volume attenuation issue. I thought you might find it interesting that he thought so much of a inexpensive fuzz pedal. If he’s talking about the tribute, ut would confirm Dunlops assertion that it is the exact same circuit as the original D-A Si Fuzz Face! I’ll let you know what he says. Thanks so very much for your website and your playing on youtube, love both! Actually, on the strength of your youtube clip and review plus comparing all the different variants of the Analogman Sunface, I’ve just gone ahead today and ordered a Sunfacec BC-109!! I’ll never forget the first time I watched Pink Floyd at Pompei, it was around about ’83-’84 and I was just 16-17..Even back then, the music seemed from a very different ealier era (I grew up listening to Electro), but I was transfixed by Dave Gilmour’s solo on Echoes. It opened up a whole new world of music for me and it wasn’t long after that I ordered a Strat copy from Manchester guitar builder, Gordon Whittam (He was one half of Gordon Smith guitars and I still have this Strat today). 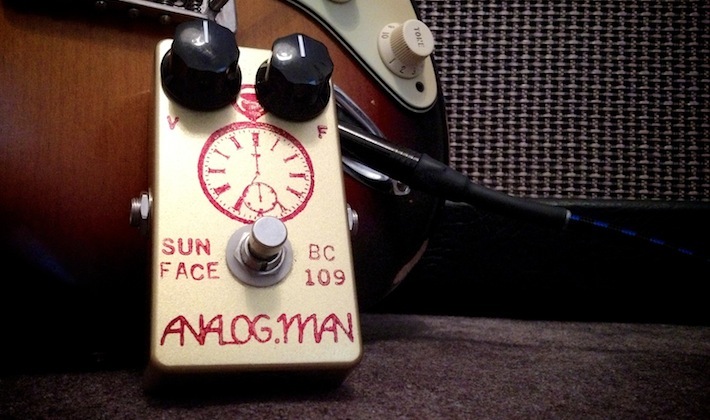 Question: Where would you put the Sunface BC-109 in the chain and also I don’t think I need a power booster pedal? This fuzz unit is both wild and dirty. Spot on DSOTM for sure, and a stayer on my board as well. Notably this unit is quite less noisy compared to e.g the Genuine Pig Face from Electronic Orange. Highly recommended. Great review. What about the Throbak ODB in the FX loop? Do you have a pinpoint for a setting which will give more headroom? I wrote that I bought a Laney Cub12R stack like yours and am curious why you put pedals in the effects loop instead of just plugging them in a row. Does it make that effect more dominant? I will experiment on my own but tell me what you think. Well done Bjorn! Anyone who’s ever wanted a Cornish G-2 but either can’t afford it or justify it’s price tag, this clip is for you. Like WOW! I always veer towards Muffs cuz I love Fuzz but hate how FF’s lack low end. This one sounds waaaaay different. Just bought mine a couple days! So pumped, now i have to save up some money now to buy the Laney Cub I am looking forward to getting! Great review and I can’t wait to get the BC109!!! Ah yes, the joys of being a heating, and A/C contractor. While installing a replacement furnace in an apartment yesterday, I was cutting a piece of sheet metal, when my left, ( fretting hand!) slipped from the shears, and the bottom side of the middle joint hit a very jagged piece of metal. I’m extremely lucky it didn’t cut the tendon in half, as I could see it, and the bone. (SORRY IF THIS GROSSES ANYONE OUT!). It cut from the left of the knuckle, to just shy of the right of the knuckle. It coukd have used a few stiches, but I needed to finish, so so toilet tissuetissue, ( about half a roll! ), stopped the river of blood, and I finished my job. Looks like I’ll need lessons fron Django for a couple of weeks. I’m amazed that it didn’t cut the tendon, cause it definitely hit the bone. I can move it just fine, although every time I do, it starts bleeding again. Ah, I love my job, NOT! Oh yeah, failed to mention it was my pinky finger! YES!!!!! THANK YOU BJORN, and your server! I once again have something to do between 4:30 am, and work. I’ve had a few very boring mornings. The God’s are smiling on Gilmourish.com, and the man behind the greatest site on the web, bar none, Bjorn Riis. Happiness is a good day, and a good day for the last year starts with a visit to Gilmourish, glad you worked it out. Hi! Just wanted to ask do you place colorsound PB before or after the fuzz to get that dark side tones? Any thoughts on how this latest 109 fuzz compares to the Skreddy Lunar Module Deluxe ? Neither are “budget” pedals by any means, and I’m sure with either your getting your monies worth, but, from much of what I’ve read, the LMMD was crafted to really nail the Darkside tones, and with the additional controls for more tonal shaping, it seems like it would be a tough act to match…. Just sent Catalinbread an email to call me when they open this morning, so I can pull the trigger. Their website,( as well as several others.) no longer says “out of stock”, so I would assume they are somewhat caught up. I hope so, Steve’s clip, as well as the many others I’ve heard since yesterday makes me think it’s as close to a real tape unit as you’ll get for $229.00! Newsflash, they are also getting ready to come out with an echo unit modeled on the original, the Echoplex! Things that make you go Hmm. Dammit Bjorn, I can’t afford this! You gave me the GAS, and I’ve evidently learned to DRIVE! HAHA! Just wanted to say thanks regarding your recommendation on the Reeves Custom 30, sounds incredible! So fat and warm! A rich tone indeed. Also very impressed with the power scaling! Slightly off topic. I have a Callahan trem I’m going to fit to my NOS DG strat. Does anyone know how David has his trem set? How many steps up and down he can whammy. I’ve watched lots of clips on set ups for trems online so i am now slightly lost in how to do it. If I should be doing it at all. Cheers for the reference – I went back and read those Gear Page posts. There’s ways to mitigate the loud/percussive nature of the first repeat – using a simpler program (e.g. mode 1), adjusting the tone and mix . . . but to my ear it is such a key ingredient to the Echorec magic formula – and CB was so faithful to the original – that you can’t “kill” it completely. Take a look at this clip, where the first repeats are using an old Teac R-to-R as a tape delay, second set are the Echorec. ER is in Mode 1/single-head, and they are both set for the same mix, and for 4 repeats. You don’t even have to listen to the clip – just look at the waveform and see how much bigger the first repeat on the Echorec is – the other repeats are pretty much the same as the tape delay. It’s just that first one. As a practical matter . . . it’s really not an issue as I’ve said. I find that as I get more comfortable with the pedal, it’s less of an issue all the time even when I just want a simple passive delay. P.S Bjorn . . . extended apologies for “hijacking” this BC 109 thread a little! Bjorn, I forgot to ask: Do you still have the banana boost in the effect loop when using the 1 W input at home? If yes I should try it whith my BD 2 keeley mod or my throbak overdrive boost. What kind of settings would you recommend? Do I have to use them for as slight boost ? Clean Boost? Thanks again for your daily work on this website! Much appreciated! In the BC 109 video, I’d like to know what input you did choose on your laney Cub head, between 1 W and 15 W ? As you put the electronic orange banana boost in the effect loop, where you using the 1 W input? Did you have to crank the amp that time? I remember you telling you had to crank the amp to make a fuzz face sound correctly… If yes what where your settings on the Cub Head? That would help!! Not using 3&4, is there anyway to edit your posts after you hit submit? That’s when I always find my many typos! Thanks Steve, you’re the first person I’ve been abke to find who actually has the pedal. The issue you spoke of was in a Gear Page thread, and there was a tech from a fairly well known company who said that you could kill that louder initial note, or original chord by not using 3 & 4 I think, and there was also a setting on one of the inside pots, I think? That kills that problem. I can’t reneber verbatim, so don’t oay attention to my details, but I found the post in a related thread to the liknk you posted. I couldn’t find yiur echoes clip. If you don’t mind not being anonymous, could you tell me your screen name, as when I clicked your link, it took me to the beginning of an Echorec thread, and the echoes clip was nowhere to be found. But mainly I wanted to make you aware that there is a way to kill that first note volume issue, but it may take a few minutes on The Gear Page to find the post! Sirry, I should have bookmarked it, but my computer skills are worse than my typing! Bjorn, what an awesome sounding video!!!!! The BC109 has been on my wish list for a while and this video seals the deal for me. I did purchase the CB Echorec and it sounds fantastic, but I am just slowly starting to experiment with all of it’s capabilities. Both buffer and true bypass sound amazing and both are very dynamic. You can go from lush space to percussive attack by how you pick and strum. The one downside to many is the mix knob. It seems as if the dry signal cuts out when the delay gets wet around 2-3 o’clock. Most delays keep the dry signal and mix the wet into it, where as the CB Echorec is either one or the other. The only way that I have gotten around this was to use the internal boost to give more signal. This provides more attack to the delay(Run Like Hell) and brings more of the dry signal to the mix. Without boosting the internal trim, I had to use a clean boost to get the delays Wall worthy. But after the internal boost I have no problems. The CB Echorec definitely nails those early Floyd delays but can be tricky for later delays found in The Wall because of the mix knob or lack of. Other than the mix knob, the delay times can be a little difficult to dial in because of the range of delay (it would be awesome if the manufactures would give users an indicator around the delay knob to more accurately dial in times). It still is an extremely versatile pedal and I will be keeping it for a long long time. As for now, it looks as though I will bitten with the BC109 fever. p.s. my only “quibble” with the Echorec is that the first repeat is much louder than your typical generic delay – no matter the settings. I don’t think this is a flaw – I think it’s essential to the “active” and percussive nature of the Echorec delay – i.e. a delay that’s more like a second instrument that wants to jam along with you and build on what you’re doing, rather than just passively repeating what your are doing but softer. But that percussive first-repeat can make fast-playing passages a little too busy. Not really an issue, though, as there are plenty of good and cheap regular delays when you don’t want the percussive thing . . .
Keith – I have the Catalinbread Echorec and to my ears it IS everything Catalinbread is claiming. Don’t have a real echorec to compare to . . . but it’s glorious good fun to play with and has the “echoes in space” sound if you know what I mean. The multi-taps are hypnotic and inspiring. This link has lots of good samples and info, including a certain rendition of the Echoes solo played really badly by someone who shall remain nameless! James Cameron,(posted above) spoke of wishing to hear it paired with the new Echorec. So James, do you have the Caitlinbread? Does anyone have one? I want to know if it’s even close to what they claim, but can’t find anyone who has one! Bjorn, I think everyone is waiting for your review before buying the Echorec, I wonder if Caitlinbread realizes how many units they’d sell if they got one to you? Maybe they don’t want you to review it, they may be afraid you won’t like it. It’s that Jedi master in you! hehe. Never tried the AM 109 but love my Skreddy Lunar Module! Perfect for me! I know I have quite a few posts in moderation, but since this is a fuzz thread, I had to tell this quick story. I just bought the 70th Anniversary Hendrix FF at Sam Ash a few days ago, but someone had lost the paperwork that was in the box. My salesfriend told me to take it home to get used to it and he’d get me another one, as there was a certificate with it. I just picked it up, and not realizing how limited the run is, was happily surprised that I have # 1012 of 2300. Sure to be a collectable! When Bjorn posts my comments about the pedal, you’ll see how I think it measures up to the JH-F1. For now I’ll just say that you should try to get this pedal! talk about nailing the tone , WOW! I’d like to here this paired with the catlinbread echo. Playing was well done as usual Bjorn, thanks for the demo. Nice play for a nice pedal! Off-topic: I’ve sent you a new backing track. Please report me any issues. Slightly off topic, but in your video you mention the Electronic Orange Banana Boost. I haven’t heard your take on how it is in general as a CPB clone. How does it compare? I have a reissue CPB but always on the lookout for something that will do the same but with modern conveniences. Even your previous review to the Throbak claimed that it was one of the best, but still didn’t REALLY nail the CPB. That some fantastic playing Bjorn…I’m speechless. Great playing Bjorn! I built a BC-109 Fuzz Face a couple of years ago and I found it to be everything you said and more. An extra bonus is how great this unit sounds with a Les Paul in front of it. Instant early Billy Gibbons, it really is a fun pedal to have on your board. Gas,Gas,Gas, I’m sitting in the floor at Sam Ash, where they just gave me all but $30 back for a JH-F1 I’ve had almost a year, but had hardly touched, and bought the extremely better sounding, and board friendly JH-M1, and a Voodoo Power plus2. The 70th anniversary Fuzz Face some say is the exact same as the JH-F1, maybe the board is, I don’t know, but the taper of the pots is totally different, the led is great, and it’s much, much quieter. It IMHO is a great step above the JH-F1, and won’t take up half my board! That, and a new GCB95 CRY BABY, and I’m a UniVibe away from a complete board, and my new board will be wired, and cranked by mid week next week! Wow, for some reason the videos of your reviews don’t work well on my phone, but I figured out I could just pop over to YouTube, where I have one subscription, your videos, and the latest review pops right up. So, I got my first look at the video for the BC -109 this morning. Wonderful version of Echoes, my favorite Pink Floyd, if not my favorite song period. I notice your whammy bar stays in place really well, and I assume you use the Callaham Vintage S bridge,(another product made here in Virginia!) Did you go for his virtual pop in bar? I got the option on mine, and you pop it in, and even though it has threads, it stays easily where you want it by merely popping it into place, no turning in of the threaded portion needed. For all who go for the Callaham, be sure to speak with him about your neck width. The standard Vintage S dies not fit Vintage Strats correctly, it positions the E strings too close to the edge of the neck because the Vintage Strat neck is a little narrower than the newer strats. I believe the Vintage neck takes a 2 7/32? , but check with Callaham, they’re extremely helpful, and you definitely don’t want to get the wrong size, it makes playing, and doing reverse bends in the 1st string nearly impossible! Great review, Great pedal, Exceptional playing as usual, my fine fingered friend. Hey Bjorn, off topic, but I wanted to find out if you’ve received your Echorec yet? Anyone out there get one yet? I’m desperate to know the scoop on the promising looking pedal, and whether it’s everything Catlinbread promises it too be. Got serious GAS for a great tape echo, and can’t wait much longer. They aren’t available to try, so I’m depending on others impression, or I may just have to get the Strymon! Are you able to get these tones with a EQ Hoof Fuzz also? What would be the difference in tone of the 2 pedals? Thanks again Bjorn, allows me to follow up my last question. If I order the 109 and add the power jack option as well as the on/off volume pot, will anything change even if I’m just using a battery? Also, have you tried it with a power supply? Now to figure out what the sundial knob does…. Fantastic demo. If I did not know better, I thought I was listening to the sound from Live at Pompeii. I like better than the BC108. as ever great review and what a great sound. 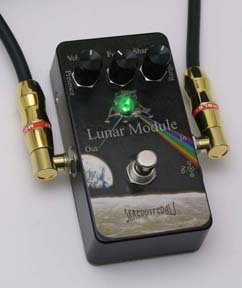 I would love to have this pedal but with such a simple circuit I would prefer the fun of building it myself. Going to try and source the parts. Would it be right to say because of the extra bottom and gain that the BC109 is easier to play than the BC108? Any chance of an AB vid between the BC108 and BC109? Great work as always, and as per usual something else to add to the wish list!! And now the bit I love LOL LOL LOL.Thats more of the old Bjorn reviews,we get to see you play.Many thanks Bjorn amazing review mate . Hi Bjorn. I know there is a dark art to recording but why is your mic slightly off center? Hi there BjÃ¶rn, as always a great review. I realy like the sound you manage to get out of it. Very transparant. I know it depends a lot on which gear has been used but it also depends on the “fingers” which are used. I’ll keep this one in mind! Thanx and kind regards, Pasqual. That sounds amazing I actually couldn’t stop laughing at how good this beast sounds. It gives the impression like its going to shatter the windows in your house its that loud but nice and smooth which is refreshing as I always think they are a bit wild and gritty. To my untrained ear anyway. If i can ever justify another fuzz pedal I have a candidate. THX!!!! inspiring playing as usual! Great job with the demo! I think it’d be pretty cool to do a direct comparison video of BC108 and BC109. I’m torn between the two because my favourite Gilmour tone of all time is DSOTM and Live at Pompeii and since he used a BC108 Fuzz Face, I’m leaning towards the BC108 but BC109 sounds killer too. If I really wanna nail his fuzz tone in those eras, should I get the BC108 or the BC109? This pedal is simply awesome, I’ve got a JHF1 Hendrix Fuzz Face, but this one is really wilder and dirtier, not so distant from a Muff even preserving evidently features of a Fuzz unit! VERY GREAT PLAYING !! STILL WAITING FOR MY IRON BELL FROM PRYMAXE, BUT THIS COULD BE NEXT… !! THANKS FOR SHARING ! !